The gap between the amount of money college sports programs make and how much goes back to the athletes continues to grow. 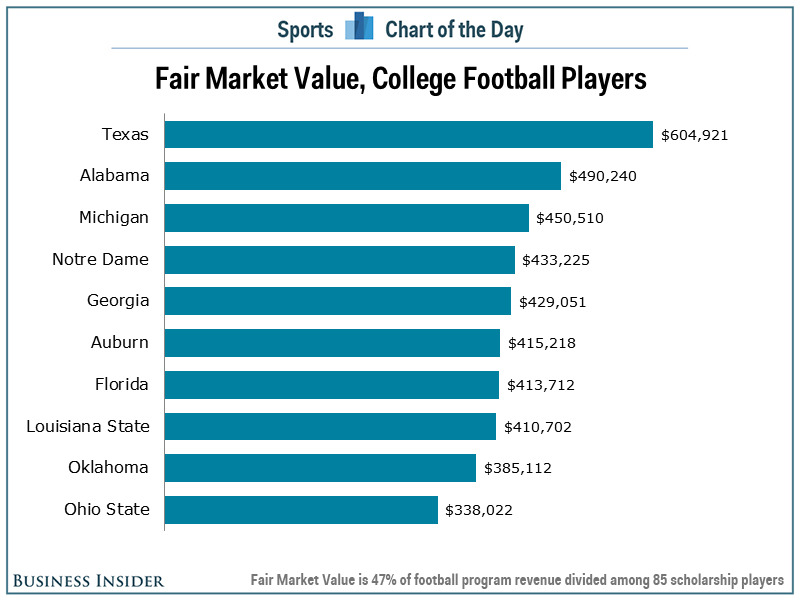 The chart below shows us how much college football players might be worth at the top programs if they were able to play in a free market system. We calculated the Fair Market Value of college football players at the ten most profitable programs using data obtained by BusinessOfCollegeSports.com. Using the NFL’s most recent collective bargaining agreement in which the players receive a minimum of 47% of all revenue, each program’s revenue was split between the school and the athletes with the players’ share split evenly among the 85 scholarship players. 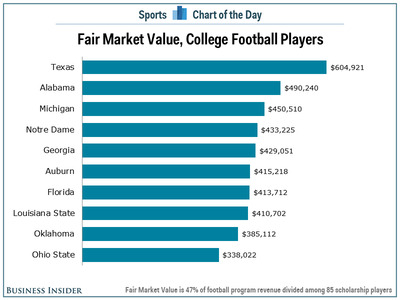 Using this method we can estimate that the average college football player at the University of Texas is worth $US605,000 per year (up from $US578,000 a year ago) based on the program’s $US109.4 million in revenue with the University of Alabama coming in second at $US409,000 per year. That’s a far cry from the $US3.8 million Texas spent on student aid for football players in 2013, or about $US44,700 per athlete.